In many previous studies, the focus of tar production has mainly been on a total amount of tars, reported in g/mn3 or mg/mn3. However, earlier work at ECN has revealed already that often (changes in) the tar composition is the dominant factor, when looking at the impact on downstream equipment. Therefore, in the framework of the project "Primary measures for tar reduction in fluidised-bed biomass gasifiers" funded by the Dutch Agency for Research in Sustainable Energy (SDE), a tar classification system was defined based on the physical tar properties: water solubility of tar and tar condensation. Table 1 gives a description for the five tar classes in the classification system with the focus on the tar properties. Table 2 presents the tar compounds that belongs to a tar class, and a sampling method for the determination of the different tar classes. Table 1: Description of the tar classes with a focus on the tar properties. Class 1 GC undetectable tars. This class includes the heaviest tars that condense at high temperature even at very low concentrations. Class 2 Heterocyclic components (like phenol, pyridine, cresol). These are components that generally exhibit high water solubility, due to their polarity. Class 3 Aromatic components. Light hydrocarbons that are not important in condensation and water solubility issues. Class 4 Light polyaromatic hydrocarbons (2-3 rings PAH’s). These components condense at relatively high concentrations and intermediate temperatures. Class 5 Heavy polyaromatic hydrocarbons (4-5 rings PAH’s). These components condense at relatively high temperature at low concentrations. In Figure 1, the dew point for the tar classes (2-5) is given at several concentrations. 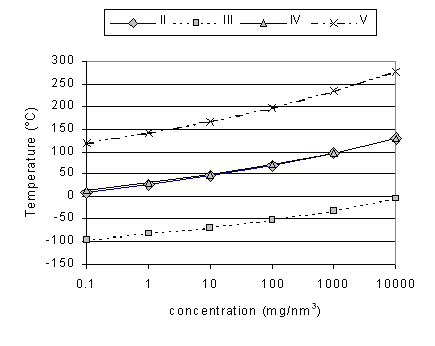 Figure 1: Relation between the tar dew point and the concentration of the different classes. Even at a low class 5 tar concentration of circa 0.1 mg/mn3, the corresponding dew point (120°C) exceeds the dew point valid for high concentrations of class 2, 3, and class 4 tars (e.g. 1000 mg/mn3). The class 3 tar compounds do not condense at concentrations as high as 10000 mg/mn3.